Every project starts with idea’s and a wish list, from this input we start working on the preliminary design where layout, sketches, mood board and artist impressions will support the design ideas.In the end of stage 1, we supply a set of drawings and technical documents to proof the feasibility of the project and sufficient information for a bid package to be sent out to a selection of shipyards. In this stage the project will be improved by repeating all design steps, and where all critical decisions are made. This is a very important stage as this is where the foundation is layed for the remainder of the design and engineering to come in stage 3 and during the build process. The engineering stage is the most time consuming part of the process, mainly on the preparation of construction drawings, system schematics, 3d shapes, 3d constructions, calculations on construction, speed and stability related subjects but also on communication with classification and flag authorities and off course the shipyard that is going to build the yacht. 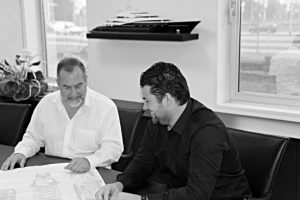 During the build process at the shipyard we will visit the yard on a regular base to inspect the work, assist the shipyard where needed. Our focus to the owners is towards safety, comfort and the pleasure that is such an important part in having your own yacht.